All aboard the Boris Express? On Friday,Sept 12th, the Hillingdon Conservative association selected Boris Johnson to be the candidate to stand as MP to replace Sir John Randall for the South Ruislip and Uxbridge constituency, in the general election next year. There have been mixed opinions to the news with many believing he will be a useful asset if he were to be elected while others not being so convinced.You can read the reaction from RAHS2 HERE. As Mayor of London it seems that Boris was instrumental in getting the rather obvious Ruislip tunnel agreed and he has definitely helped facilitate our group meeting with TFL and other useful HS2 contacts. He also seems to agree that the Heathrow Spur is a total waste of time and money. RAHS2 have requested a meeting with Boris at the earliest opportunity and we are hoping that we can get him to clarify his position on HS2. We remain a non political campaign group but we are aware that we will need to work with any MP that is eventually elected and will therefore make sure we communicate with all the other candidates. 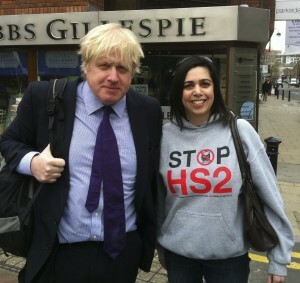 HAHS2 have already met with Chris Summers – the Labour candidate – who has confirmed he will be supporting the Stop HS2 message.